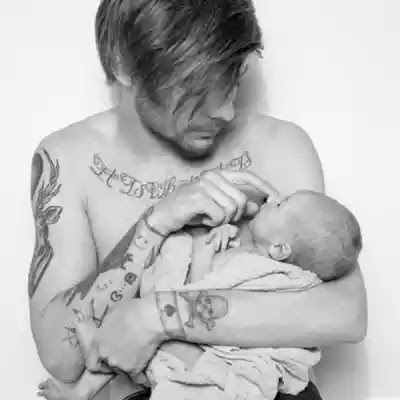 Louis Tomlinson caused a stir on Instagram’s with a new photo of his newborn son Freddie pressed, once again, against his bare chest. The new dad, who welcomed his son with Briana Jungwirth in January, shared the photo with his 8.2 million followers on Friday. “Lad and Dad,” the black-and-white picture is simply captioned, showing Tomlinson gingerly touching his son’s face. In just one hour, the photo garnered over 578,000 likes. The post also had more than 91,000 comments from devoted One Direction fans. “Omg, that’s too cute,” and “THIS IS SO CUTE,” were just some of the fan reactions flooding his Instagram page. As Gossip Cop has reported, Tomlinson and Jungwirth are successfully co-parenting their son, despite a slew of inaccurate reports claiming there’s drama between the two. Gossip Cop recently corrected a false report from In Touch that alleged Tomlinson demanded a DNA test after his son’s birth. We also busted that tabloid’s sister publication, Life & Style, when it wrongly claimed Jungwirth was planning to sue the singer over child support.